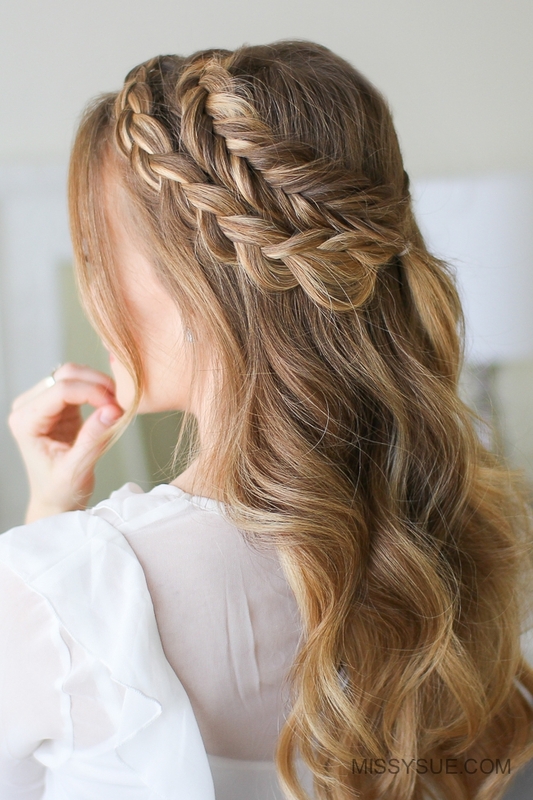 All I’ve been able to think about lately are fun, Summer hairstyles. Obviously I’m ready for winter to be over, haha! 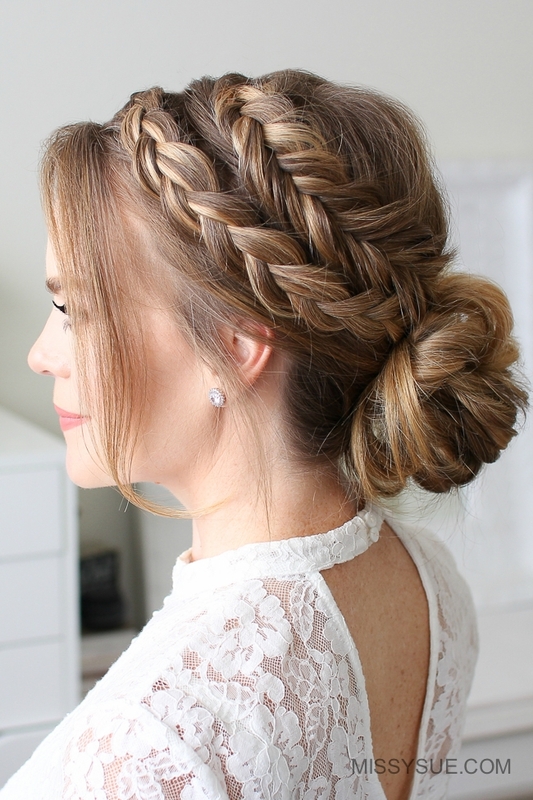 This hairstyle has always reminded me of the warmer months and can’t wait to wear it all Summer long. With that, I figured now is as good a time as any to share a tutorial. 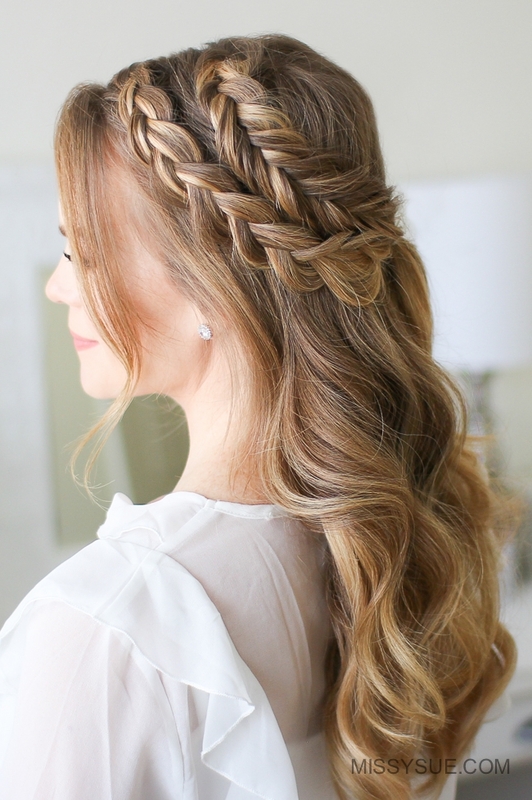 to style these braids. I hope you enjoy the tutorial and would love to hear which version is your favorite so be sure to let me know in the comment section. 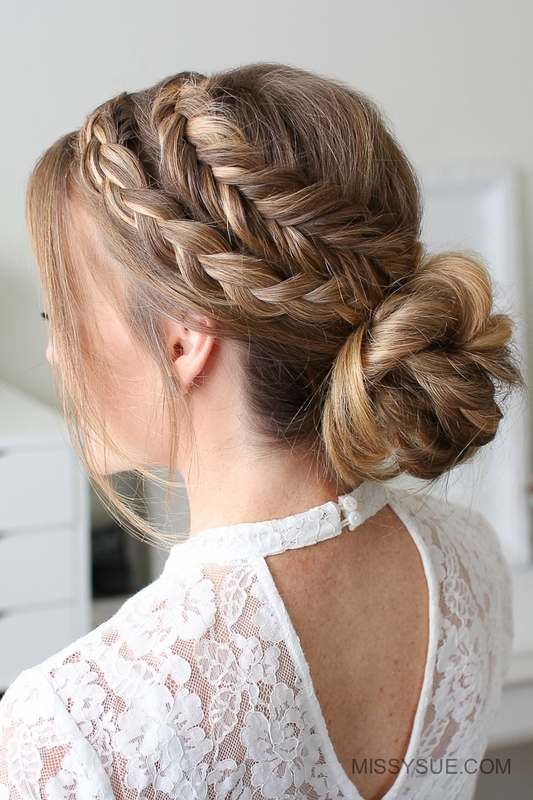 Here are a few similar hairstyles that you might also love! Step 2 / Now divide the hair on the left side into two sections and clip away the forward section. 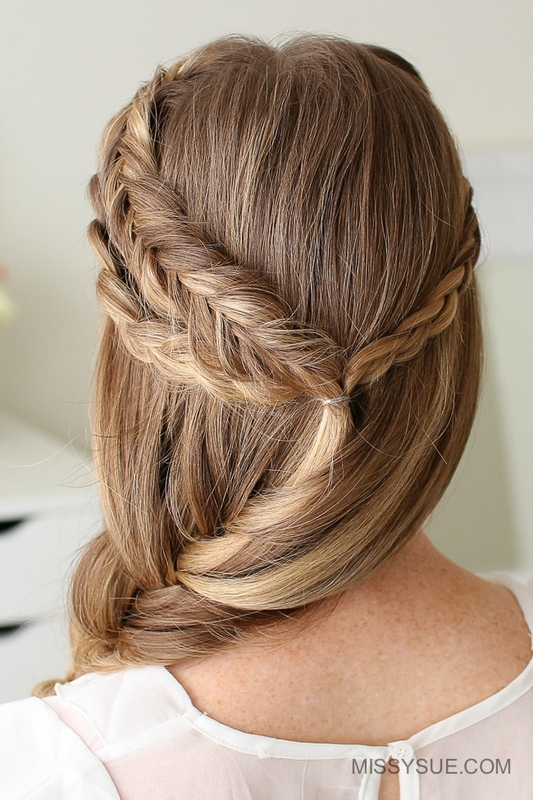 step 3 / With the back section, pick up a small piece for the fishtail braid and divide it into two pieces. Step 4 / Cross a small piece from the right side under to the left side. Then cross a small section from the left side under to the right side. Step 5 / Continue crossing small sections from one side under to the opposite side while adding new sections into the braid. Step 6 / Repeat those steps until the braid reaches the left temple. Step 7 / Once the braid reaches the temple continue the fishtail braid down to the ends and cross two bobby pins over the bottom. Step 8 / Let down the front section of hair and pick up a new section near the part dividing it into three sections for the dutch braid. Step 9 / Cross the side strands under the middle strand while incorporating new pieces into the braid working down to the left temple. Step 10 / Then braid the rest of the section to the bottom and cross two bobby pins over the ends. Step 11 / Now go back over the braids, pulling on the edges to make them wider and more full. 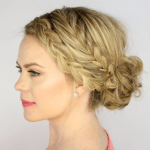 Step 12 / Pick up a 1″ section on the right side of the part and create a third braid working down to the bottom and crossing a bobby pin over the end. 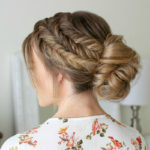 Step 13 / Then bring all three braids around to the back of the head and tie them together with a clear elastic band. 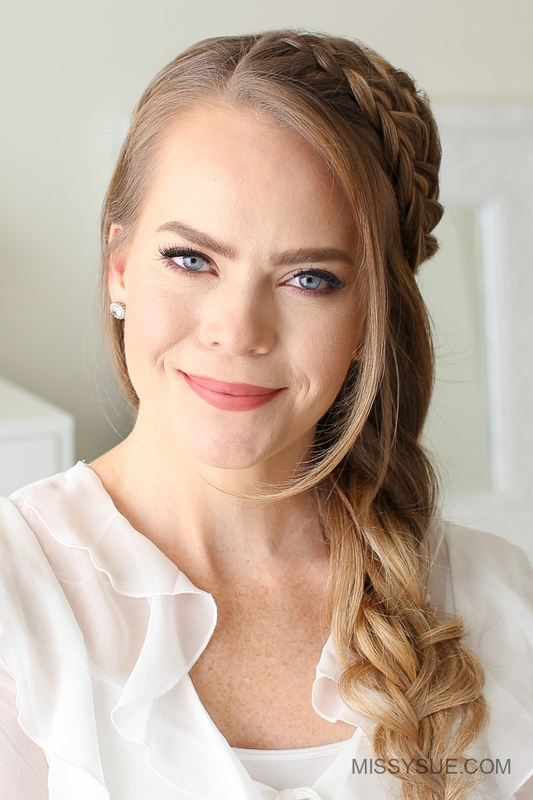 A second way to wear these braids is in a side fishtail braid. Step 1 / Bring the rest of the hair over the left shoulder. Step 2 / Divide it into two sections and begin by crossing a small section from the right side over to the left side. Step 3 / Then take a small piece from the left side and cross it over to the right side. Step 4 / Repeat those steps crossing small sections from one side over to the opposite side and braiding all the way to the bottom. Step 5 / Then go back over the braid, pulling on the edges to make it wider and more full. Step 6 / Then tie off the end of the braid with a clear elastic band. 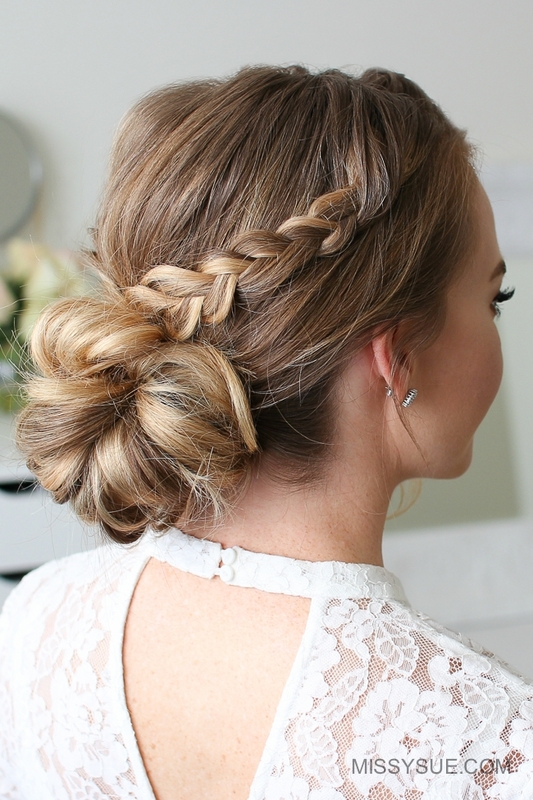 A third way to wear these braids is in a messy bun. Step 1 / Start by combining all of the remaining hair at the nape of the neck. Step 2 / Wrap all of the hair once with a hair band. Step 3 / Wrap the hair band over the right hand and spread the ponytail up around the hair band. Step 4 / Then wrap the hair band twice more over this base to form of the bun. Step 5 / Pull on the edges of the bun to make it bigger and tighten the bun against the head. Step 6 / Now take the hair left sticking out, loop it back towards the hair band and tuck it in. Step 7 / Then pin down any pieces that are sticking out.